"And you thought this was a paperweight..."
The violet and purple varieties of quartz provide the most prized, and in many respects the most interesting of the large family of quartz minerals. 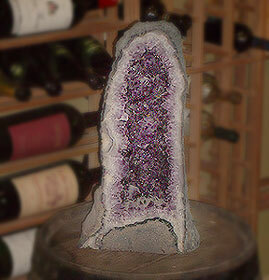 Amethyst, the name by which this variety of quartz is known is of ancient derivation. Pliny stated that the gem was so-called from the color being near to, but not quite reaching that of wine. Roman myth indicates that the god Bacchus, offended by something was determined to avenge himself, and announced that the first person he encountered would be devoured by his tigers. A fair and beautiful maiden named Amethyst, who was on her way to worship at the shrine of Diana happened to be that first luckless mortal. As the ferocious beasts sprang towards her, she sought the protection of the goddess, and was saved from a worse fate by being turned into a pure white stone. Recognizing the miracle and repenting his own cruelty, Bacchus poured the juice of the grapes as a libation over the maidens petrified body, thus giving the stone a beautiful violet hue.